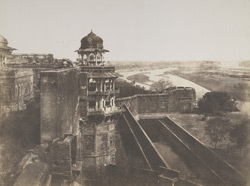 Photograph of the Fort-Palace in Agra, from the Murray Collection: 'Photographic views in Agra and its vicinity', taken by John Murray in the mid-1850s. The complex stands on the banks of the Yamuna and was built by the Emperor Akbar (r.1556-1605) between 1565 and 1573. Built principally as a military establishment on the site of an earlier walled complex, the fort is considered the predecessor of the Delhi Red Fort. Akbar lived at Agra in the early years of his reign returning there in his last years after having lived at Fatehpur Sikri and Lahore. The Emperor Shah Jahan (r.1628-58), who built most of the interior fort buildings as well as the nearby Taj Mahal, renamed Agra Akbarabad after his grandfather. Akbar died in 1605 and is buried at Sikandra, five miles from the city.